Dame Judith Olivia "Judi" Dench, CH, DBE, FRSA is an English film, stage and television actress. Her film appearances were infrequent until she was cast as M in GoldenEye , a role she has played in each James Bond film since. She received several notable film awards for her role as Queen Victoria in Mrs. Brown , and has since been acclaimed for her work in such films as Shakespeare in Love , Chocolat , Iris , Mrs Henderson Presents and Notes on a Scandal , and the television production The Last of the Blonde Bombshells . Dench has received many award nominations for her acting in theatre, film and television; her awards include ten BAFTAs, seven Laurence Olivier Awards, two Screen Actors Guild Awards, two Golden Globes, an Academy Award, and a Tony Award. In June 2011, she received a fellowship from the British Film Institute . Dench was born in Heworth, York, England, the daughter of Eleanora Olave (née Jones), a native of Dublin, and Reginald Arthur Dench, a doctor who met Judi's mother while studying medicine at Trinity College, Dublin. Dench attended The Mount School, a Quaker Independent Secondary school in York, and became a Quaker. Her brothers, one of whom is actor Jeffery Dench, were born in Tyldesley, Lancashire. Notable relatives also include her niece, Emma Dench, a Roman historian and professor previously at Birkbeck, University of London, and currently at Harvard University, Cambridge, Massachusetts. In 1971, Dench married British actor Michael Williams and they had their only child, Tara Cressida Frances Williams, known professionally as Finty Williams, on 24 September 1972. Dench and her husband starred together in several stage productions, and the Bob Larbey British television sitcom, A Fine Romance (1981&ndash;84). Michael Williams died from lung cancer in 2001, aged 65. In Britain, Dench has developed a reputation as one of the greatest actresses of the post-war period, primarily through her work in theatre, which has been her forte throughout her career. She has more than once been named number one in polls for Britain's best actress. Through her parents, Dench had regular contact with the theatre. Her father, a physician, was also the GP for the York Theatre, and her mother was its wardrobe mistress. Actors often stayed in the Dench household. During these years, Judi was involved on a non-professional basis in the first three productions of the modern revival of the York Mystery Plays in the 1950s. In 1957, in one of the last productions in which she appeared during this period, she played the role of the Virgin Mary, performed on a fixed stage in the Museum Gardens. Though she initially trained as a set designer, she became interested in drama school as her brother Jeff attended the Central School of Speech and Drama. She applied and was accepted, where she was a classmate of Vanessa Redgrave, graduating with a first class degree in drama and four acting prizes, one being the Gold Medal as Outstanding Student. In September 1957, she made her first professional stage appearance with the Old Vic Company, at the Royal Court Theatre, Liverpool, as Ophelia in Hamlet, then her London debut in the same production at the Old Vic. She remained a member of the company for four seasons, 1957&ndash;1961, her roles including Katherine in Henry V in 1958 , and as Juliet in Romeo and Juliet in October 1960, directed and designed by Franco Zeffirelli. During this period, she toured the United States and Canada, and appeared in Yugoslavia and at the Edinburgh Festival. She joined the Royal Shakespeare Company in December 1961 playing Anya in The Cherry Orchard at the Aldwych Theatre in London, and made her Stratford-upon-Avon debut in April 1962 as Isabella in Measure for Measure. She subsequently spent seasons in repertory both with the Nottingham Playhouse from January 1963 , and with the Oxford Playhouse Company from April 1964. That same year, she made her film debut in The Third Secret. In 1968, she was offered the role of Sally Bowles in the musical Cabaret. As Sheridan Morley later reported: "At first she thought they were joking. She had never done a musical and she has an unusual croaky voice which sounds as if she has a permanent cold. So frightened was she of singing in public that she auditioned from the wings, leaving the pianists alone on stage". But when it opened at the Palace Theatre in February 1968, Frank Marcus, reviewing for Plays and Players, commented that: "She sings well. The title song in particular is projected with great feeling." After a long run in Cabaret, she rejoined the RSC making numerous appearances with the company in Stratford and London for nearly twenty years, winning several best actress awards. Among her roles with the RSC, she was the Duchess in John Webster's The Duchess of Malfi in 1971. In the Stratford 1976 season, and then at the Aldwych in 1977, she gave two comedy performances, first in Trevor Nunn's musical staging of The Comedy of Errors as Adriana, then partnered with Donald Sinden as Beatrice and Benedick in John Barton's "British Raj" revival of Much Ado About Nothing. As Bernard Levin wrote in The Sunday Times: "...demonstrating once more that she is a comic actress of consummate skill, perhaps the very best we have." One of her most notable achievements with the RSC was her performance as Lady Macbeth in 1976. Nunn's acclaimed production of Macbeth was first staged with a minimalist design at The Other Place theatre in Stratford. Its small round stage focused attention on the psychological dynamics of the characters, and both Ian McKellen in the title role, and Dench, received exceptionally favourable notices. "If this is not great acting I don't know what is", wrote Michael Billington in The Guardian. "It will astonish me if the performance is matched by any in this actress's generation", commented J C Trewin in The Lady. The production transferred to London, opening at the Donmar Warehouse in September 1977, and was adapted for television, later released on VHS and DVD. Dench won the SWET Best Actress Award in 1977. In 1989, she was cast as Pru Forrest, the long-time silent wife of Tom Forrest, in the BBC soap opera The Archers on its 10,000th edition. She had a romantic role in the BBC television film Langrishe, Go Down , with Jeremy Irons and a screenplay by Harold Pinter from the Aidan Higgins novel, directed by David Jones, in which she played one of three spinster sisters living in a fading Irish mansion in the Waterford countryside. Dench made her debut as a director in 1988 with the Renaissance Theatre Company's touring season, Renaissance Shakespeare on the Road, co-produced with the Birmingham Rep, and ending with a three month repertory programme at the Phoenix Theatre in London. Dench's contribution was a staging of Much Ado About Nothing, set in the Napoleonic era, which starred Kenneth Branagh and Samantha Bond as Benedick and Beatrice. She has made numerous appearances in the West End including the role of Miss Trant in the 1974 musical version of The Good Companions at Her Majesty's Theatre. In 1981, Dench was due to play the title role of Grizabella in the original production of Cats, but was forced to pull out due to a torn Achilles tendon, leaving Elaine Paige to play the role. She has acted with the National Theatre in London where, in September 1995, she played Desiree Armfeldt in a major revival of Stephen Sondheim's A Little Night Music, for which she won an Olivier Award. In 1995, she took over the role of M (James Bond's boss) with the James Bond film series, starting with GoldenEye replacing Robert Brown. She has appeared in six James Bond films, including Casino Royale and its direct sequel Quantum of Solace , making her the longest-running current cast member of the series. She is currently filming her seventh Bond film, Skyfall, to be released in 2012. She has won multiple awards for performances on the London stage, including a record six Laurence Olivier Awards. She also won the Tony Award for her 1999 Broadway performance in the role of Esme Allen in David Hare's Amy's View. She has taken on the role of Director for a number of stage productions. Dench won the Academy Award for Best Supporting Actress as Elizabeth I in the film Shakespeare in Love. 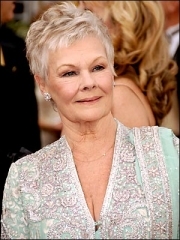 Judi Dench has frequently appeared with her close friend Geoffrey Palmer. They co-starred in the series As Time Goes By, where she played Jean Pargetter, becoming Jean Hardcastle after she married Lionel Hardcastle. The program spanned nine seasons. They also worked together on the films Mrs. Brown and Tomorrow Never Dies, both filmed in 1997. Dench has also lent her distinctive voice to many animated characters, narrations, and various other voice work. She plays the role of "Miss Lilly" in the children's animated series Angelina Ballerina and as Mrs. Calloway in the Disney animated film Home on the Range. She has narrated various classical music recordings (notably Mendelssohn's A Midsummer Night's Dream, and Britten's Canticles-The Heart of the Matter), and has appeared in numerous BBC radio broadcasts as well as commercials. Her many television appearances include lead roles in the series A Fine Romance and As Time Goes By. In the United States, As Time Goes By has been repeated on PBS and on BBC America. Dench returned to the West End stage in April 2006 in Hay Fever alongside Peter Bowles, Belinda Lang and Kim Medcalf. She finished off 2006 with the role of Mistress Quickly in the RSC's new musical The Merry Wives, a version of The Merry Wives of Windsor. Dench's more recent film career has garnered six Academy Award nominations in nine years for Mrs. Brown in 1997; her Oscar-winning turn as Elizabeth I in Shakespeare in Love in 1998; for Chocolat in 2000; for the lead role of writer Iris Murdoch in Iris in 2001 ; for Mrs Henderson Presents in 2005; and for 2006's Notes on a Scandal, a film for which she received critical acclaim, including Golden Globe, Academy Award, BAFTA and Screen Actors Guild nominations. In 2007, the BBC issued The Judi Dench Collection, DVDs of eight television dramas: Talking to a Stranger quartet , Keep an Eye on Amélie , The Cherry Orchard , Going Gently , Ghosts , Make and Break , Can You Hear Me Thinking? (co-starring with her husband, Michael Williams, 1990) and Absolute Hell . Dench, as Miss Matty Jenkins, co-starred with Eileen Atkins, Michael Gambon, Imelda Staunton and Francesca Annis, in the BBC One five-part series Cranford. The series began transmission in the UK in November 2007, and on the BBC's U.S. producing partner station WGBH in spring 2008. Dench became the voice for the narration for the updated Walt Disney World Epcot attraction Spaceship Earth in February 2008. In February 2008, she was named as the first official patron of the York Youth Mysteries 2008, a project to allow young people to explore the York Mystery Plays through dance, film-making and circus. This culminated on 21 June with a day of city centre performances in York. She worked on the 22nd Bond adventure Quantum of Solace and reprised her role as M.
She is interested in horse racing and in partnership with her chauffeur Bryan Agar owns a four-year-old horse, "Smokey Oakey", who won the 2008 Brigadier Gerard Stakes. She returned to the West End from 13 March – 23 May 2009, playing Madame de Merteuil in Yukio Mishima's Madame De Sade, directed by Michael Grandage as part of the Donmar season at Wyndham's Theatre. A year later, Dench renewed her collaboration with Sir Peter Hall at the Rose Theatre in Kingston upon Thames in A Midsummer Night's Dream which opened in February 2010, when she played Titania as Elizabeth I of England in her later years: Queen of the Forest of Arden. On 31 July 2010, Dame Judi performed Send in the Clowns at a special celebratory Promenade Concert from The Royal Albert Hall as part of the Proms Season, in honour of composer Stephen Sondheim's 80th Birthday, the entire concert in honour of his music. Whole or part of the information contained in this card come from the Wikipedia article "Judi Dench", licensed under CC-BY-SA full list of contributors here.